Students and staff will be educated about the effect that scents have on individuals and what alternatives are available. 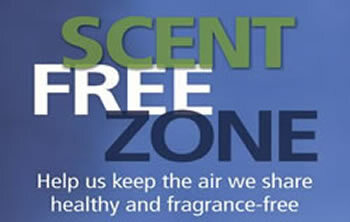 Signs will be posted at all entrances and in highly visible locations stating THIS IS A SCENT SMART BUILDING. Anyone found to be using or wearing scents will be asked to leave the building immediately or remove the scent. Any infraction of this policy may also result in disciplinary action. “Scent Smart” applies to persons and groups using the building after hours. Lotions/ Creams: Lubriderm Unscented, Marcelle Face Cream, Almay Face Cream, Clinique, Noxema sensitive skin and fragrance free, Neutrogena face cream.